In a game that was back-and-forth all the way down the stretch, the Friars were able to stay undefeated on the season and close out Illinois in the inaugural Dave Gavitt Tip-Off at the Dunkin’ Donuts Arena. Kris Dunn wasn’t at his best but was able to show up down the stretch and make some clutch plays in order to hold off the Fighting Illini, who had 3 chances in the final seconds to try and steal this one from the Friars. Ben Bentil was able to carry the scoring in the first half with Kris Dunn struggling with foul trouble. It’s good to see that Rodney Bullock (20 points against Harvard) or Bentil can step up and take some of the pressure off of Dunn by putting the ball in the basket. You need three viable scoring options to be successful in college basketball. Although the Friars are much smaller this year with the loss of both Paschal Chukwu and Carson Desrosiers from last year’s squad, their wing positions are very long with freshman Ryan Fazekas and Rodney Bullock. What this team lacks in pure height, it makes up for with effort on the boards, grabbing 10 offensive rebounds in the first half alone. Bentil did a little bit of everything on his way to his first double-double of the year, finishing with a fat stat line of 18 points, 12 rebounds (including a whopping 8 offensive), 3 assists, 3 steals, and 2 blocks. There may be a lot of guys that Bentil matches up with that are going to be much bigger than him but no one is ever going to outwork Ben, FACT. It’s funny how his three-point shot can look so drastically different from one shot to the next. One will be pure and the next will be off the side of the backboard, it’s inexplicable. I do like how they’re trying to stretch out his range this year though. He shot a total of 30 three point shots last year (he was 9 for 30) and already has 12 attempts through just 2 games this season. He’s started off a little shaky at just 2-12 but he’s certainly not scared to let it fly. It was good to see Jalen Lindsey back in the rotation after sitting out the first game for a team violation. Rodney Bullock followed up his great game against Harvard with another good game, finishing with 13 points (6 for 12) and 6 rebounds. He’s a lot bigger than I expected. His game reminds me a lot of UConn’s Daniel Hamilton in that he has good size, shooting range, and plays more of an in-between game, being able to finish over smaller players down low and displaying a solid mid-range game that extends all the way past the 3-point line. I was especially impressed with Kyron Cartwright and his ability to run the show with Dunn on the bench during the first half. His three-point shot looks miles smoother than that season and he isn’t afraid to take it strong to the rim. He made half as many three’s against Illinois (2) as he did all of last year (4). He was an unfathomable 4 of 33 from long distance last year so it’s nice to see that he may have turned that weakness into a strength for this year. It says a lot about his work in the off-season. Plus, I love how Bill Raftery says his name as KEY-RON! 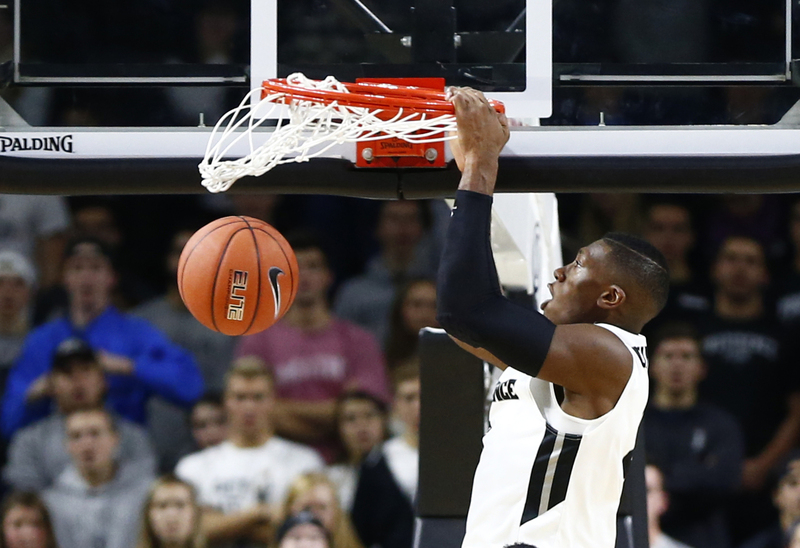 How sweet was alley-oop to Kris Dunn against the Illini zone? Toooo Sweet, that’s how sweet. The freshman, Jalen Coleman-Lands on Illinois has an absolutely beautiful stroke. That jumper is picture perfect. Once Illinois gets all their guys back from injury, they’re going to be trouble in the stacked Big Ten. The Illini’s big guy Mike Thorne Jr. was supposed to be a big factor in the game against the smaller PC lineup but he fouled out after playing only 13 minutes. Literally, every single time he came back in the came he fouled almost instantly. It was amazing to watch. Every time I heard the name of the big white guy Michael Finke on Illinois, all I could think of was Finke is Einhorn! Einhorn is Finke! Providence NEEDS to make their free throws going forward. They finished just 8 for 18, which is one of the main reasons that Illinois had so many chances to take the game at the end. Even when Kris Dunn isn’t clicking offensively, you can still count on his stellar defense…like that game-sealing block (before the chaotic last possession). Yeah, he’s kind of athletic. I need the Friars to work in a couple more of corner three plays for my man Ryan Fazekas. He’s a really good shooter and it’ll open up the floor more for Dunn to penetrate…which will in turn make for more opportunities for kick-outs…it’s all circular. How smooth did this left-handed baby hook look from frosh Quadree Smith? I need me some more of that. PC is still in the “Others Receiving Votes” section of the college rankings but the next couple game of their schedule look favorable until the URI rivalry match-up, so they could sneak in if they continue the season undefeated for a little while. Next Up, the Friars take on Brown on Saturday at 7 PM at the Dunk.